After the snow melts, one of the first wildflowers to emerge is Bloodroot (Sanguinaria canadensis). Native to the eastern U.S. and Canada, it grows in woodlands and moist areas. Its name comes from its reddish-orange sap, which will stain and cause disfiguring lesions on your skin. Native Americans used the root to make a reddish dye, so one wonders if they suffered contact with the plant or if it was diluted when used. 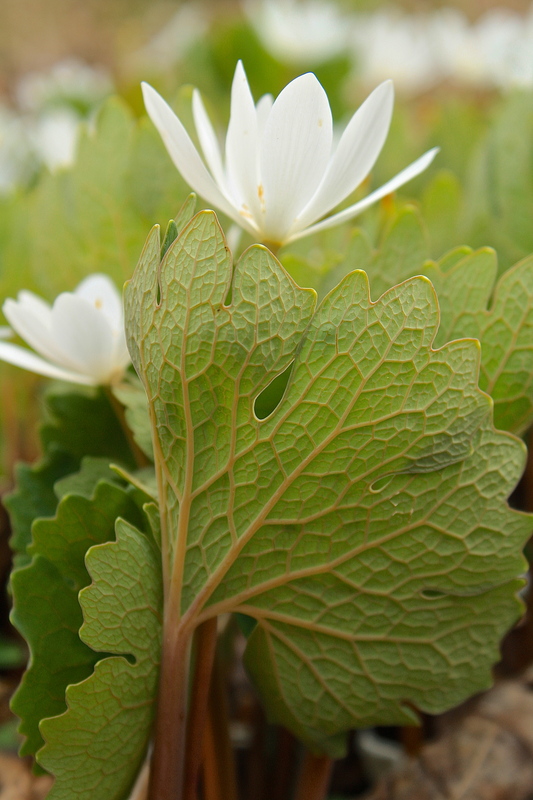 Bloodroot spreads readily to form large colonies, ideally in moist, pH neutral soil in partial to full shade. My colony grows under deciduous red maple trees, which leaf out after they bloom, and shortly before Bloodroot complete their growing season, becoming dormant in late spring. There is a double cultivar available from nurseries, which doesn’t spread as readily as the native variety as they produce less seed. Collecting plants from the wild is prohibited, so always purchase from a reputable nursery. I believe collecting seed is allowed; however, always leave enough to ensure the growth of the colony. Image | This entry was posted in Country Gardening, Country Living, Field Notes, My Photos and tagged ants, bloodroot, ecology, gardens, native plants, natural dyes, photography, Sanguinaria canadensis, seed dispersal, wildflowers, woodlands. Bookmark the permalink. At night the leaves close up like a cloak, wrapping the flower. Cool, huh? Years ago, people indiscriminately pillaged wild populations of plants leading to local extinctions, so they made it against the law to collect wild plants and animals. It is technically illegal to “save” a baby bird or squirrel without a license. Even owning a wild bird nest is against the law, because some birds re-use nests, like raptors and crows. It’s one of those laws that don’t really get enforced until you are caught, then uh-oh, you pay! Ultimately, it is to protect wildlife and that is a good thing. Thanks for that lengthy reply. I feel like I have the whole picture, and I’m glad to know that the law-makers are protecting nature. When I was in Wales, our guides always took pride in pointing out bluebells, and always mentioned that it was forbidden to pick them. They told us that bluebells grew near old growth trees. I admire people who know so much about nature. What a beautiful leaf – very textured. Thanks, it is another of nature’s great works! How interesting, I can not remember ever seeing one on my woodland walks. It would be interesting to try as a dye .. Thank for sharing all these wonderful facts, especially about the ants. You often see them along ditches that hold ephemeral water. They like moisture, but not disturbed land. They are really all around our area, once you note them, you will see them everywhere! They are emerging now, so keep your eyes peeled! Fascinating, just that leaf alone is so textured and full of interesting patterns. Thanks for sharing! Thank you, Amy. Not sure where you live, but it is found in the eastern U.S. & Canada in moist areas. Hmmmm…..I live in WNY and I have never seen this. Moist areas. In forests? Yes, deciduous forests and field edges. The season is now through June when they go dormant. I think they prefer maple groves because the soil is in their ideal pH range. OH OH! I did spell it wrong. I thought I did. I wrote on the photograph Hyancinth. Oops. Oh well, now you know I am human. They haven’t bloomed yet. I am still waiting …. Funny, I didn’t even notice it was misspelled! No matter! Ooops, me and my mouth. GRIN! So interesting! I have never seen it here in Virginia but that does not mean it’s not here. Thanks for sharing the Bloodroot story Eliza. So I went straightaway to look that up… it “makes way for the light of new potential” – indeed a good symbol. I’ll look for that artwork 🙂 Have a great weekend. A beautiful shot. I like the way the leaves seem to be protecting the flowers. Thank you, Fi, much appreciated! Great photo. And just a few days ago was a “blood moon” so timing is great too! Thanks, I hadn’t thought of that until you mentioned it, but I guess you’re right. Must have been subconscious! Thanks, Robbie. Another wonder of nature, I agree. Nature’s beauty always astounds me!